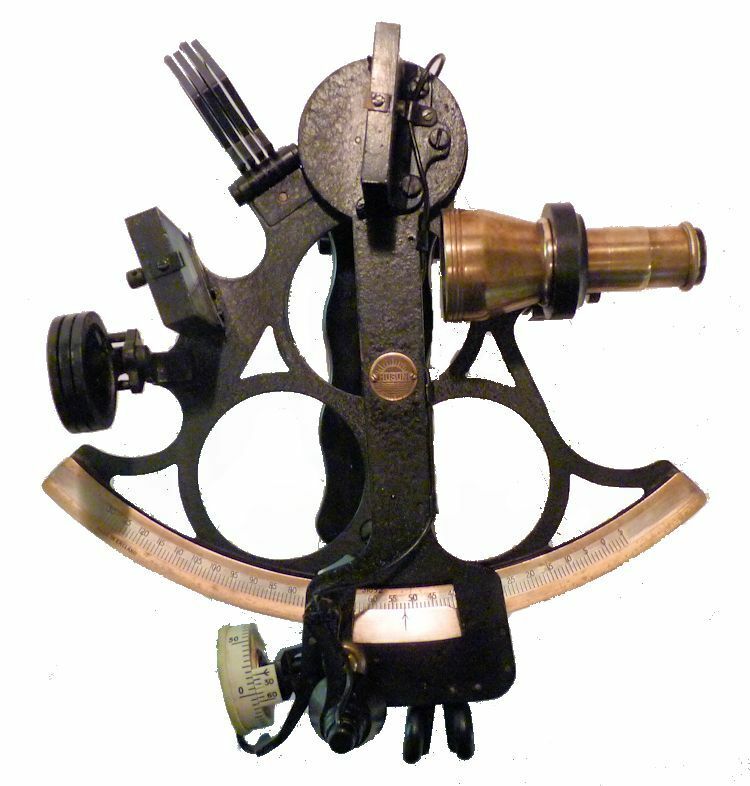 PRESENTED is a fine Word War II Era mariner's sextant with an extended arc from -5 to +135 degrees that almost equals a quintant. It has a graduated insert made of a proprietary metal that Hughes called “Platina“ (platinum) arc and vernier, with brass frame and fittings. Engraved at mid-center of the arc at the bottom is "Henry Hughes & Son Ltd., London". Hughes was one of England's foremost “Class A“ instrument makers. Over this is the serial number 31052. The instrument is shown with the low power Star scope fitted. The original inspection certificate issued by Hughes in October 4, 1943 is mounted in the case. Like modern instruments, no error is greater than 20 arc seconds over its usable range. 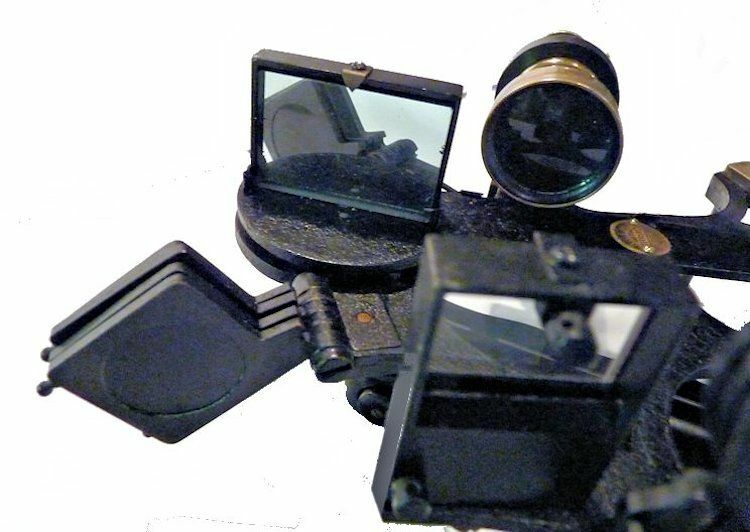 ACCESSORIES: All the original accessories are included consisting of a high powered collimation scope, a terrestrial sighting tube, the aforesaid star scope, bottle of oil, adjustment pick for mirrors, end cap for scopes and key for the case. The three ring design was used by C. Plath and the English firms of Heath and Hughes in vast quantities because of the inherent strength of the frame's design. 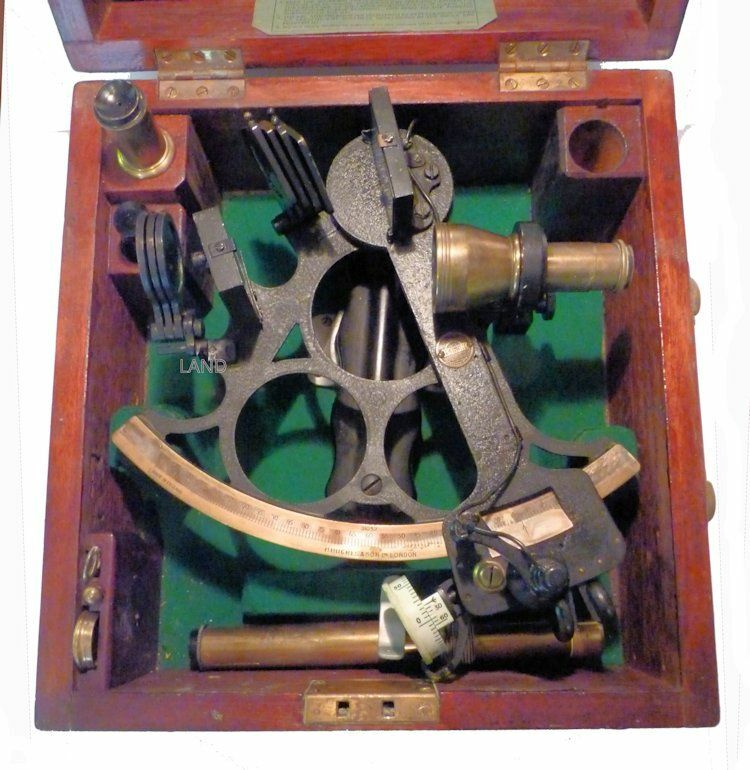 This sextant is fitted with larger than the normal size mirrors for this period so it is highly suitable for twilight sights when the low powered Star scope is fitted. INSTRUMENT CONDITION: The mirrors are in remarkably near new condition and show little age. The index arm quick release clamp, and swing arm magnifier are complete and in good working order. Like with many older instruments, a lighting system is fitted but does not work. A electrician should be able to fix this since most of the wiring is external. A small flashlight will work as well. The frame has a beautiful midnight black wrinkle finish. Overall, the instrument is in very good condition for its 73 year age. BRIEF HISTORY OF THE HUGHES FAMILY: The Hughes family were originally clock makers in the East End of London who progressed into supplying sextants and chronometers to ships coming into the River Thames. In 1712 Thomas Hughes became a member of the Worshipful Company of Clock makers at the age of 26, and was elected as Master of the Worshipful Company of Clock makers in 1742. His son, Thomas Hughes (junior), had his business at 25 New Bond Street, London, and was elected as Master of the Worshipful Company of Clock makers in 1762. In 1781 William Hughes, believed to be the son of Thomas Hughes Junior, was elected freeman of the Worshipful Company of Clock makers and sold a cabin clock to captain Cook. Joseph Hughes, believed to be the son of William born in 1781, lived and worked at 16 Queen Street, Ratcliffe. 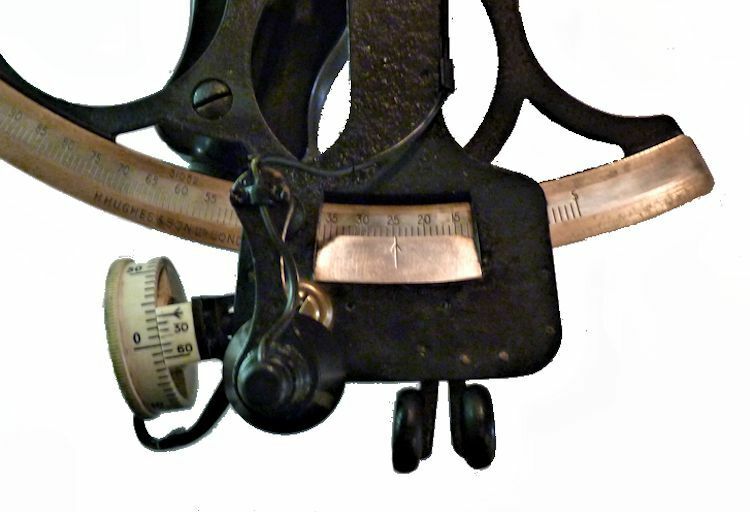 He was to become a well-known maker of quadrants and compasses. His son Henry Hughes was born in 1816. Henry Hughes & Son was founded in 1838 at 120, later 59, Fenchurch St. in London, as an optician and maker of chronographic and scientific instruments. Henry died in 1879 and his son Alexander succeeded him as chairman. The firm was incorporated as Henry Hughes & Sons Ltd in 1903 and in 1923, the company produced its first recording echo sounder. In 1935, a controlling interest in the company was acquired by S. Smith & Son Ltd resulting in the development of marine and aircraft instruments. Following the London office's destruction in the Blitz of 1941, a collaboration was entered into with Kelvin, Bottomley & Baird Ltd, resulting in the establishment of Marine Instruments Ltd. Following the formal amalgamation of Kelvin, Bottomley & Baird Ltd and Henry Hughes & Sons Ltd in 1947 to form Kelvin & Hughes Ltd, Marine Instruments Ltd acted as regional agents in the UK for Kelvin & Hughes Ltd who were essentially now a part of Smith's Industries Ltd founded in 1944 as the successors of S. Smith & Son Ltd. 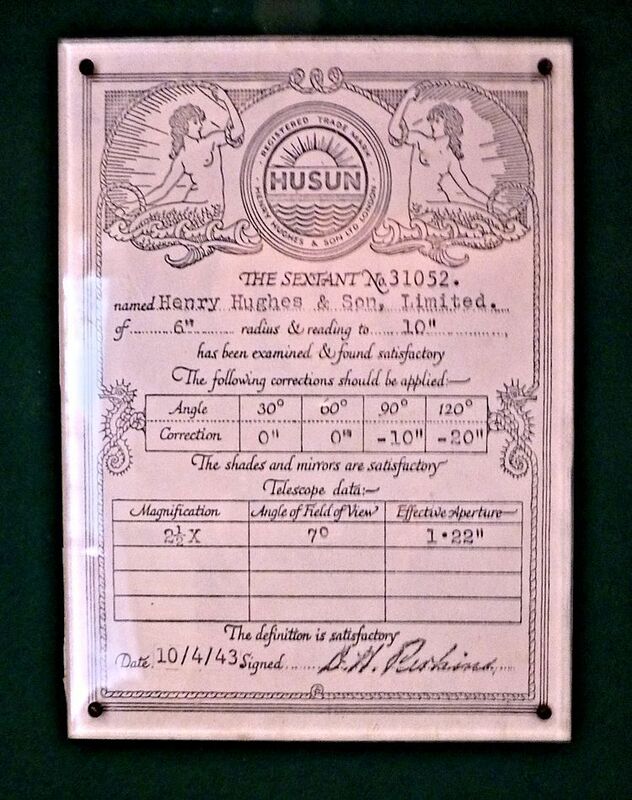 The well known "HUSUN" trademark was in use starting in the 1920s. The non tarnishing platinum scale is calibrated -5 to +130 degrees with a vernier scale on the drum reading from 0 to 60 arc seconds in 15 second intervals. 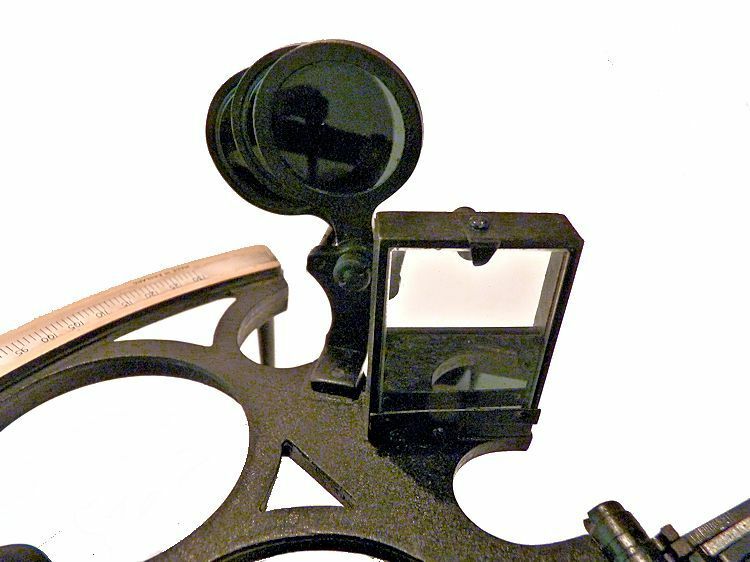 The sextant has four rectangular shades for the index mirror, and three round shades for the horizon mirror, all in good order. The telescope's distance from the frame may be adjusted by turning a knob at the back of the rising piece. This most useable feature was discontinued in later sextants because of its high cost. 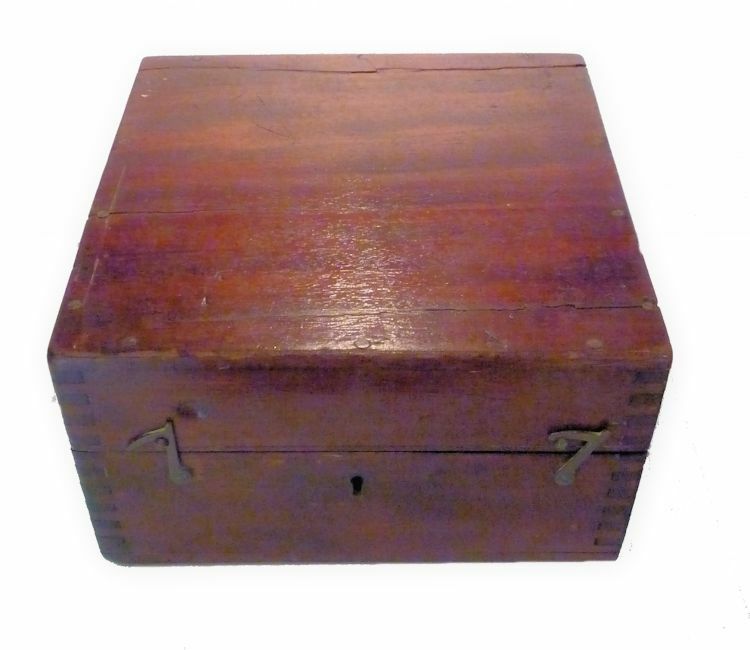 The instrument and it's accessories are housed in a square Mahogany carrying case which has brass hinges and latches and a lock, and key. The case has what may be a later lined green felt interior which looks factory fresh. The exterior has bright varnish with the top having a crack running its width at the top and bottom. These do not effect its strength. LABEL: On the inside top of the case is a green label with the maker's instructions on how to care for the instrument. THE CASE: The hardwood case has a lengthwise crack at the top and bottom when viewed from the front. Neither of these have affected its structural integrity. The inside is lined in what appears to be factory installed fresh green high quality felt. It is in excellent solid condition, even with two age cracks. As would be expected, there also are some scratches. There is a key. It is brightly varnished and has a wonderful old golden patina of age. A very rare and highly desirable instrument from one of the best known English instrument makers. Radius of arc 6 3/4"
Width of frame at arc 8 1/4"
FLAT RATE SHIPPING & PACKING by FedEx Ground Insured for to the 48 contiguous states for $40.00. ACCEPTED FORMS OF PAYMENT are Bank wire transfer, cashier's check, money order, or personal check in which case the item will be held until cleared. PayPal or credit cards may be used, but at an extra charge.